ReSharper provides a variety of features to get additional info about code, select and highlight structural blocks of code, as well as apply local code transformations. ReSharper extends the default highlighting support of Visual Studio with custom highlighting of code items in different languages. For example, you can easily distinguish between local variables and fields in your code. 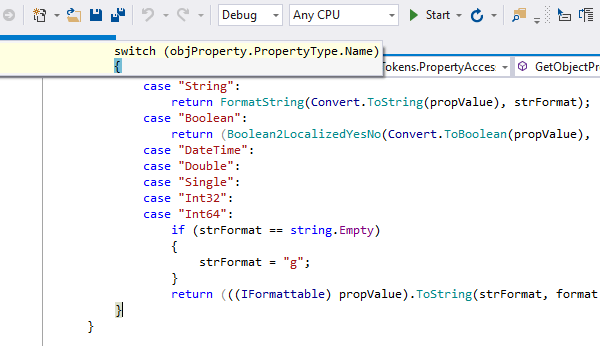 To switch on ReSharper's highlighting, go to ReSharper | Options | Code Inspection | Settings and select Color Identifiers. The custom color for each item is configurable. ReSharper's context actions save you a lot of typing by quickly introducing minor changes to the code under your caret - for example, you can change access modifiers, generate code that checks for null, convert foreach to for and back - all with a couple of keystrokes. If one or more context actions are available for the current caret position, ReSharper displays the hammer icon : you can either click the icon or press Alt+Enter to select an appropriate action. This feature inserts necessary syntax elements (braces, semicolons etc.) and sets you in position to start the next statement, saving you from excessive juggling with the caret. As you work, keep in mind the default shortcut for this feature: Ctrl+Shift+Enter. Complete Statement (also known as Smart Enter) comes to rescue in numerous scenarios, including auto-closing parentheses, adding semicolons, completing if, while and for statements, and so on. 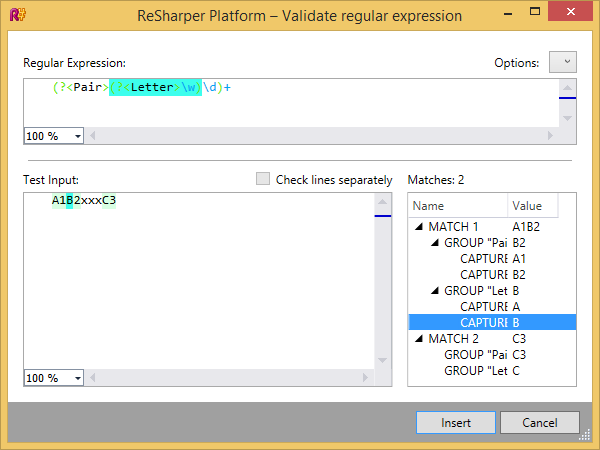 You can choose ReSharper | Tools | Validate Regular Expression in the menu to enter various sample strings and see how your regular expression matches these strings. Using this dialog, you can fix your expression and make sure that you get the expected match. 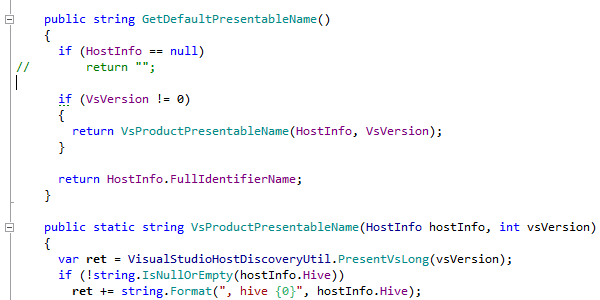 This part of Visual Studio's IntelliSense is also extended in ReSharper. When you call a method, Parameter Info shows you all available method signatures and parameters with relevant documentation in a tooltip. The tooltip appears automatically while you type, or you can display it by pressing Ctrl+Shift+Space. 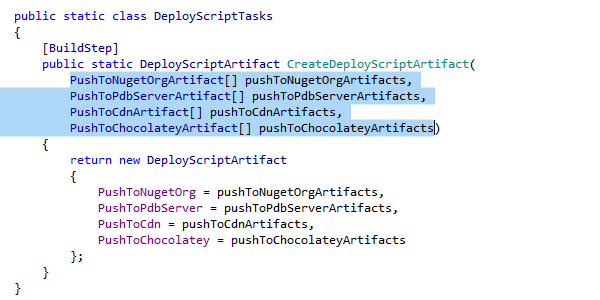 While you are adding new arguments, ReSharper grays out any signatures that become incompatible. In VB.NET, the matching Sub or Function is highlighted when the caret is placed anywhere within or after End Sub or End Function. The matching keyword and its line are highlighted whenever you place the caret within the opening keyword (again, you can fine-tune this feature). In XML, matching tags are unobtrusively highlighted, letting you see the tag structure. If a matching piece of code scrolls off the screen, an appropriate pop-up appears for your convenience. When a type name cannot be resolved because you forgot to issue the corresponding namespace import directive in the source code, a small pop-up appears to suggest one or more types to import. Simply press Alt+Enter, and the appropriate namespace import directive will be inserted automatically. Also, you will not lose your current caret position. For markup files in web applications, ReSharper is able to auto-import user controls (ascx files) based on their usages. When you type (, [, ", or ' in the editor, a paired character is inserted automatically (whenever appropriate). This feature may be easily switched off, but you shouldn't be afraid of inserting too many closing parentheses, brackets, or quotes by mistake: if the closing parenthesis or quote already exists, ReSharper will not add the second one. In XML, as soon as you type an opening quote or bracket, the closing one appears automatically. Quickly duplicate any line (block) of code by placing the caret at this line in the editor (or, respectively, selecting a block) and pressing Ctrl+D. ReSharper allows you to quickly change the order of code elements with the press of a key — well, four keys: Ctrl+Shift+Alt+Up/Down/Left/Right. In particular, you can move members up and down, reorder parameters and arguments, move statements within a block, move statements out of or into a block, move XML tags up and down, as well as XML attributes left and right, and so on. To see the documentation for a certain class, method/function or other symbol right in the editor, position the caret on a code symbol and press Ctrl+Shift+F1. The documentation shows in a pop-up window with clickable links to other resources, most notably MSDN documentation. Promptly comment or uncomment any block of code by selecting it in the editor and pressing Ctrl+Alt+/ (for line comment) or Ctrl+Shift+/ (for block comments). You can also use Ctrl+Alt+/ to quickly comment or uncomment the line of code where the caret is located in the editor if no block code has been selected. In the same circumstances, pressing Ctrl+Shift+/ inserts the opening block comment (/*) and the closing block comment (*/) immediately before and immediately after the caret position, or removes them if the caret is positioned inside the commented code block. The Extend Selection feature helps successively select expanding blocks of code. That is, you can easily select any expression in the code by placing the caret somewhere inside it and pressing Ctrl+Alt+Right a few times. Shrink Selection works in the opposite way and can be applied by pressing Ctrl+Alt+Left. You can also quickly select the member that your caret is on, or even its containing type, by pressing Ctrl+Shift+[. When you have to type lengthy string literals, ReSharper helps you split them into several lines by adding the necessary quotation marks and plus characters: while the caret is within a string literal, press Enter or Shift+Enter to split the string without breaking its value. ReSharper provides a special Paste command accessible by pressing Ctrl+Shift+V, which lets you access your clipboard history and quickly paste any of the recent items copied from Visual Studio to the clipboard. ReSharper starts recording copied items to its clipboard history as soon as you start Visual Studio and clears the history when you close it.